The Canadian men's four, men's quadruple sculls and the women's eight teams each reached the podium at the 2015 World Rowing Cup II in Varese, Italy on Sunday. 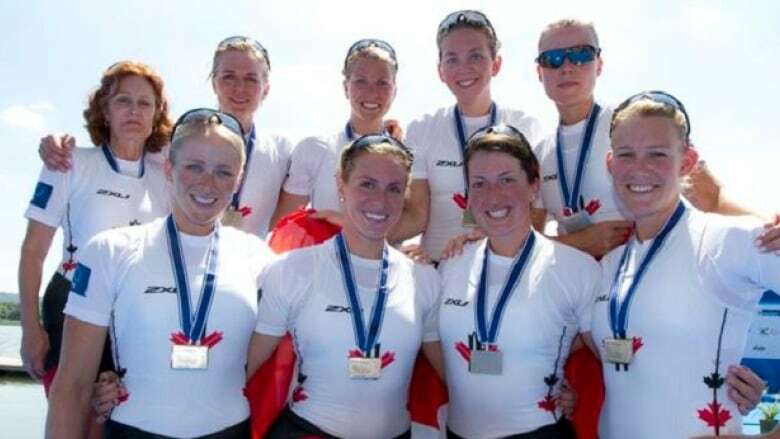 The Canadian women's eight-plus team won silver on Sunday. The Canadian men's four, men's quadruple sculls, and the women's eight-plus teams each reached the podium at the 2015 World Rowing Cup II in Varese, Italy on Sunday. The team of Cristy Nurse, Lisa Roman, Susanne Grainger, Jennifer Martins, Christine Roper, Ashley Brzozowicz, Natalie Mastracci, Lauren Wilkinson, and Lesley Thompson-Willie placed second with a time of 6:05.530 over a distance of 2000 metres. The United States recorded a time of 6:03.270 to take gold, while Great Britain finished in third with a time of 6:08.660. "It was a gutsy race. Obviously we wanted to win, but it was the best race we could have today, so overall that is good," said Roper in response to Canada's silver medal performance. Meanwhile the men's four team of Will Crothers, Tim Schrijver, Kai Langerfeld, and Conlin McCabe placed third in a time of 5:52.520 also over a distance of 2000 metres. The United States won the race in a time of 5:51.870, with Italy finishing second in 5:52.480 to narrowingly edge out the Canadians. "Italy snipped us at the end and they were in front of their home crowd...It's relatively early in the season so we will analyse our splits, thanks to the good flat conditions here and we'll see what we can work on," said McCabe on coming away with a bronze medal. Furthermore the men's quadruple sculls team of Matthew Buie, Julien Bahain, Will Dean, and Rob Gibson also earned a third-place finish with a time of 5:45.450. Great Britain won the race in 5:43.130 and Germany finished second with a time of 5:44.270.